PAN stands for Permanent account number and it is provided by income tax department to every income taxpayer. Any person who has never applied for a PAN can apply for it. There is no minimum or maximum age requirement for getting a PAN card even a minor can get it. Each PAN card is a 10 character unique number. The first five character of each PAN are English alphabets the next four digits are numbers and the last one is again an alphabet. The fourth character of your PAN reveals your status. If the fourth character of your PAN is P then you are a person, if it is C then the PAN belongs to a company, if it is H then you have taken it for HUF. Likewise, F represents Firm, A refers the association, T represents trust and G refers the government. Please see the black circle in the above sample picture. The fifth character of your PAN uncovers secret info about your surname or last name. The fifth digit of your PAN is, in fact, the first letter of your surname or last name. For example, if your name is Lalit Bhojwani then the fifth character of your PAN will be B . Please see the red circle in the above sample picture. 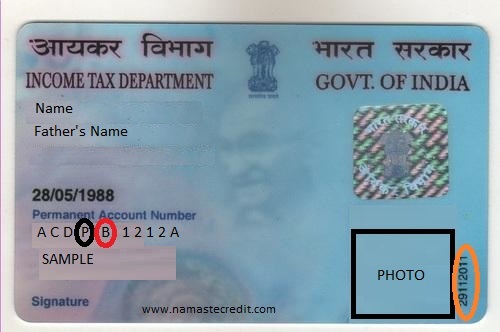 The vertical digits on the lower right side of your PAN card photo reveal the secret about your PAN issue date. These vertical digits are the date when your PAN was issued by the IT department. Please see the orange circle in the above sample picture. The fee for processing PAN application is just 107.00 INR if your communication address is in India. Some consultants collect a high fee for PAN card so be careful and apply online for PAN card at the NDSL or UTIITSL websites. Every PAN number is unique and you can not find two PAN cards with identical numbers. One person cannot hold two PAN cards. It is illegal to hold multiple PAN with the same name or in one capacity. You should surrender additional PAN if issued to you by mistake. Your PAN number is unique and permanent it cannot be changed.You can get a duplicate one if your PAN card has been misplaced or stolen but the PAN card number will remain unchanged. You won’t see photograph in any PAN card of minors as physical changes come faster in minors. However, you have to submit the photo of minor while applying for PAN. Five-day-old Bihar girl Ashi has become youngest PAN card holder in India. Pan cards are valid worldwide because PAN cards do not show your address. The backside of your PAN card is not required for any purpose. It only shows the address of the PAN card issuer that’s why many PAN cards have the same backside. Save paper and don’t take the photocopy of it. You can get a PAN card if you are a foreigner, a foreign company or an NRI. Your PAN is valid for entire lifetime, therefore, do not worry about PAN’s renewal as PAN is issued only once and it is not renewed. You need not worry if you lost or forgot your PAN. You can know your PAN anytime just entering your date of birth and surname in this link. If you have any PAN card number and you want to verify the name on it or you want to know jurisdictional assessing officer of the PAN card please follow this link. You cannot download a soft copy of PAN Card like your Aadhar Card, but you can apply for a duplicate PAN Card. You cannot file your ITR without having PAN card. PAN is mandatory for filling income tax return. You cannot open a Demat or a bank account without PAN card and even in the case of joint Demat account both the account holders must have PAN card. PAN card is mandatory for almost all the financial-sector transactions like investing in mutual funds and shares. Everything on your PAN card can be changed except your PAN number by submitting a separate application form. You can request online or offline to change or correct your name, date of birth, signature, photo or father’s name. Visit NSDL or UTIITSL portals for changing any info on your PAN card. Namaste Credit automatically verifies your PAN cards through NSDL when you apply for a new home or business loan with Namaste Credit website or Android app. Can you open a PAYPAL account in India without PAN? Can you link your PAN card number with your Adhaar Card? Good information , if we want to check the PAN card is original or duplicate is it possible . Whoever edits and pusiblhes these articles really knows what they’re doing.